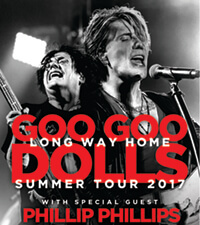 Goo Goo Dolls return to the Stir Cove concert series while on their “Long Way Home” tour. The group features singer and guitarist John Rzeznik plus bassist and singer Robby Takac both now on their 11th album called Boxes. Songs like “Name” and “Iris” have held slots on the Billboard Charts in the No. 1 position for 17 consecutive weeks. In addition to global tours, Rzeznik was honored with the Songwriters Hall of Fame Hal David Starlight Award, a recognition never to be ignored. Accompanying them on this tour is Phillip Phillips who released “Home” in 2012 reaching a five-time platinum status. Due to his soulful sound, Phillips brings his Georgia upbringing to performs songs from the past three albums. With both of these groups on stage, the audience can bet on having a fun-filled evening.